Inductive sensors are used for speed sensing and are based on principle of electric voltage induction in the coil caused by magnetic field change. These sensors are used for speed and position sensing of ferromagnetic target wheel or of mark from magnetically soft material. This sensor is suitable for crankshaft or camshaft speed sensing. This sensor is suitable for crankshaft or camshaft speed sensing with high accuracy of phase delay parameter. It is manufactured in two versions which differ in cable length. 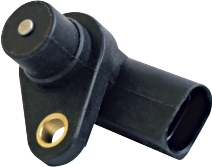 This sensor is suitable for transmission or crankshaft speed sensing. It is manufactured in two versions which differ in sensor length. This sensor is used for accurate adjustment of injection unit of diesel engines.